There is no point in denying it. The PlayStation 4 is a more powerful machine than the Xbox One. It has a better GPU and better RAM, and will absolutely produce better-looking graphics than the Xbox One will be capable of. Sheer horsepower isn't the only thing that matters, though. We're now two years into this generation, and it is pretty clear the PS4 has a distinct power advantage. Multiplatform games typically run at a lower resolution or a less stable framerate on XONE than on PS4. It's a fact now. But that's okay. 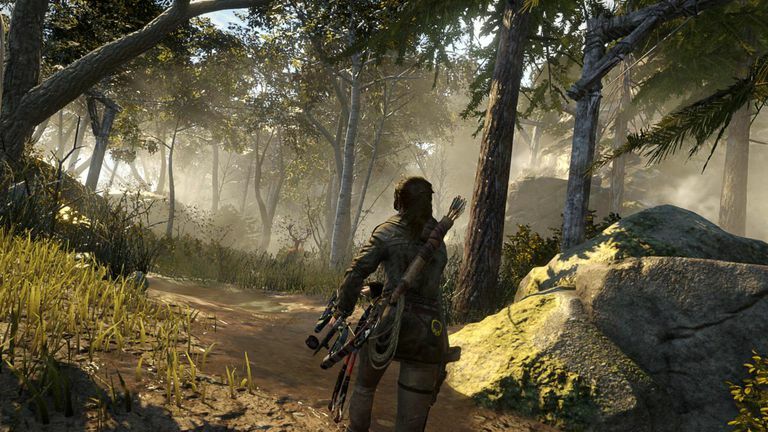 All it means is that Xbox One versions of games won't look AS good, but they will still look good. People don't seem to understand this, though. I have even seen some forum posters come to the conclusion that "The Xbox 360 version is 720p, which means the Xbox One version will look the same as the 360 version". This is just silly, people. The Xbox One is multiple times more powerful than the Xbox 360. Just because the resolution of the games isn't higher doesn't mean the graphics won't be better. The Xbox One will be able to have more characters on screen. More particles on screen. More special effects on screen. Better artificial intelligence. Better lighting. Better physics. Better looking textures. And it will be able to do all of this while maintaining a consistent frame rate. Games will unquestionably look and perform better on Xbox One than the current generation. Period. And while they may not look as good as their PS4 counterparts, they will still look great. Consider this about resolution. The NES, SNES, N64, GameCube, and even the Wii all ran at 480i resolution (yes, I know the GC and Wii did have optional progressive scan 480p modes), but you can't deny that the graphics greatly changed from one generation to the next despite the resolution being the same. Also, consider this - many Xbox 360 games weren't even natively 720p, yet they still looked very good. Your favorite game on Xbox 360 and loads of them on PS3 were probably 540p, 600p, or some other "sub-HD" resolution upscaled to 720p or 1080p on your TV. One final note is that while the PS4 is more powerful, it doesn't actually hit the mythical "1080p / 60FPS" target all that often, either. It should be made clear that the current sub-1080p "problem" is not a long-term problem that the Xbox One will face. Just because launch games are struggling to get to 1080p doesn't mean that developers will still be struggling with it in a year or two. As developers gain more experience with developing for next-gen, they will learn how to optimize games for better visuals and better performance. Think back to launch games on the Xbox 360, and then compare them to the games created today. The 360 launch games look awful in comparison. The Xbox One will see the same, if not better, the level of improvement as time goes by. I'm not worried about the Xbox One's graphical capabilities in the least. A final point is that while the PS4 will be able to produce better visuals than the Xbox One, pure power doesn't matter all that much. Fun games are what ultimately matters, and you don't need top of the line graphics to make good games. Honestly, if you really care about graphics first and foremost you shouldn't be buying a console anyway. You should be building a gaming PC where even a mid-range build will blow both the Xbox One and PS4 out of the water. Which is why all of the hand-wringing and back and forth between fanboys about whose box is more powerful is all pretty dumb. One argument against the Xbox One that might have some merit is that it is less powerful than the PS4 yet cost $100 more when it first launched. Nowadays, however, the Xbox One is actually $50 cheaper than the PS4, so no problems here anymore. Is power important? Of course. Is graphics important? Of course. But they aren't as important as the games themselves, no matter how big of a mountain console warriors want to build out of this molehill.